FRENCH LICK, Ind. – Monday’s first round of the Senior LPGA Championship was more about history than anything else. Winds gusting to 33 miles per hour prevented spectacular scoring – with one exception. Scotland’s Trish Johnson, no stranger to the Pete Dye Course at French Lick Resort, made five birdies in her last 12 holes to shoot a 5-under-par 67. That was good for a 4-stroke over Carolyn Hill, one of the early starters in the 81-player field. Johnson and Hill were the only players under par after Day 1. Johnson, a late starter, was the 2016 winner of The Legends Championship on the same course when she beat Juli Inkster in an epic six-hole playoff. Inkster is on broadcast duty at the U.S. Women’s Open and not competing in this first major championship for senior women. Johnson, though, was glad to be back on the Pete Dye design that is filled with dramatic elevation changes, spectacular views and confounding greens. It didn’t seem to fit so well early in her round. After two birdies in the first four holes Johnson missed a three-foot putt at No. 5 and made double bogey on the next hole. Then the good times rolled. Johnson bounced back from the double with a bogey at No. 7 to get back in red numbers then birdied 11, 14, 15 and 18 No. 15 came on the shot of the ay, a chip-in. Trish Johnson faces a media horde after shooting a 67. The other players weren’t nearly as sharp as Johnson, but they weren’t complaining after finally getting their first major championship for women in the over-45 age group. 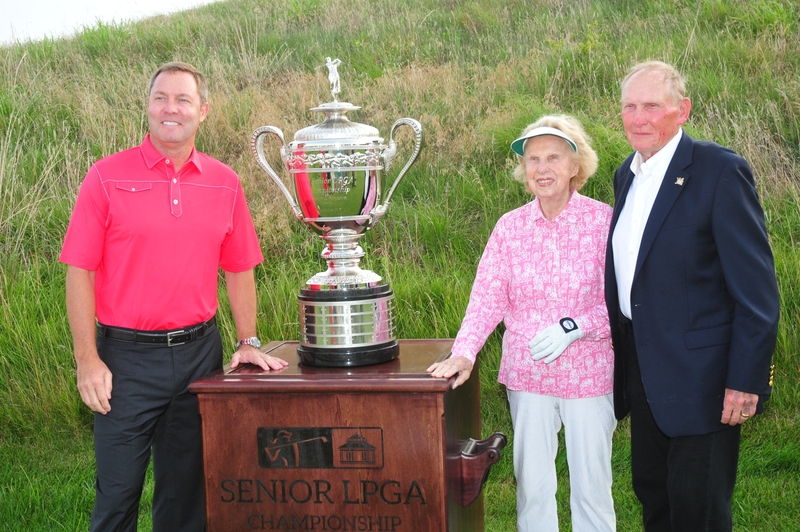 Jeray was especially happy for the older players who meant so much to the development of the LPGA. None of the players were more appreciative than Jane Blalock, at 71 the oldest player in the field. She played in the Honors tournament held in conjunction with the Symetra Tour’s Donald Ross Centennial Classic on Sunday at the nearby Donald Ross Course. 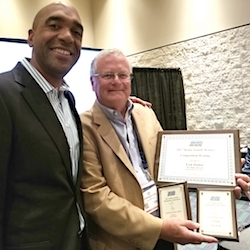 Blalock created the Legends Tour and usually just plays in the small division for older members at its tournaments. She wanted to go all three rounds of the first Senior LPGA Championship, however, because of its significance to women’s golf. She also wants to compete in the first U.S. Senior Women’s Open, an event put on by the U.S. Golf Association at Chicago Golf Club in 2018. 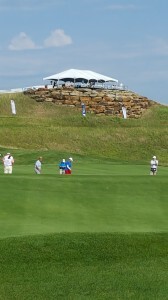 A new choice viewing spot on the 18th hole is available for the Senior PGA Championship. It’s all part of the boost that women’s golf expects to get from finally getting a major championship. This week’s has live coverage from The Golf Channel all three days and a $600,000 purse with the champion receiving $90,000. By comparison, The Legends Championship – its predecessor at French Lick since 2013 –was by far the biggest event on The Legends Tour. When Johnson won last year it was a 36-hole tournament with $75,000 in prize money and a winner’s purse of $37,700. 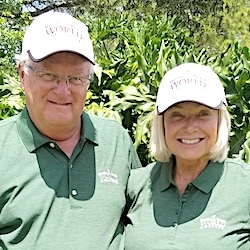 Mike Whan, commissioner of the LPGA Tour, joined Alice Dye, wife of course designer Pete Dye, in hitting the ceremonial first tee shots before Monday’s round. 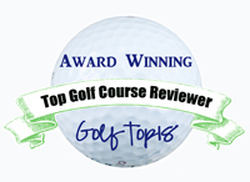 Whan sees big things ahead for women’s golf as well. 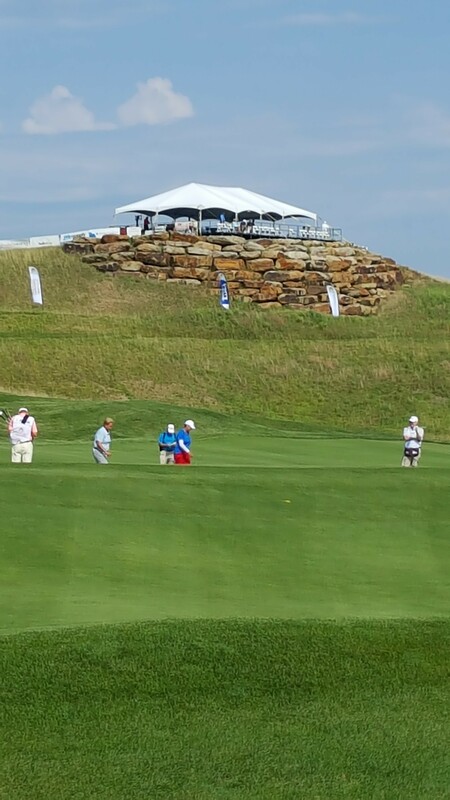 French Lick has a five-year agreement to host both the Senior LPGA Championship and Donald Ross Centennial Classic. Two former champions in The Legends Championship enjoyed the 18th hole on Monday. 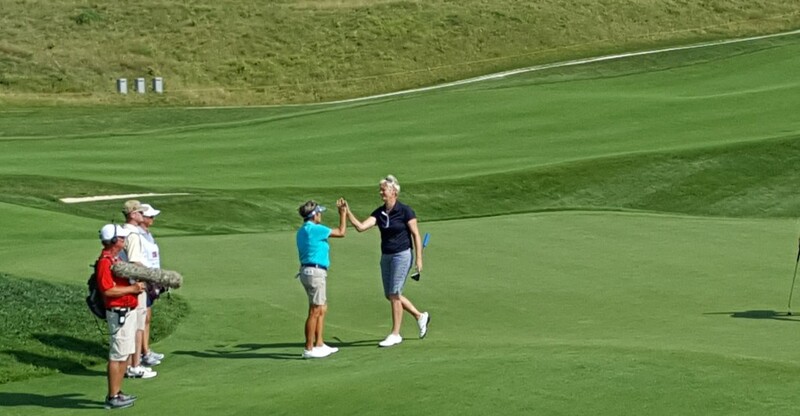 Laurie Rinker (left) rolled in an eagle putt from off the green and got a high-five from Trish Johnson, who made birdie.